The Happy Egg Company, the UK’s largest free-range egg brand owned by Noble Foods, has awarded its multi-million pound above-the-line account to The Clinton Lab. A joint venture between Live & Breathe and The Clinton Partnership, The Clinton Lab is a team of 120 based in Farringdon, Leeds, Marlow and Dublin. The account, which sees Noble Foods double its annual media budget for The Happy Egg Company from the previous year, was won following a two-way competitive pitch against Publicis London. The agency’s first task will be to deliver a multichannel campaign led by TV, due to break later this year. The Clinton Partnership first began working with The Happy Egg Company in 2008, when it was appointed as the ad agency to launch the brand in the UK. Media planning and buying will continue to be handled by JAA Media. The agency will report in to Geraldine Phillips, marketing director for The Happy Egg Company, Noble Foods Ltd.
Nick Gray, managing director of Live & Breathe and The Clinton Lab, said: “We pitched for this account in very good company. We truly believe that progressive clients want an alternative to the standard agency model. We are on a mission to provide something different and better. 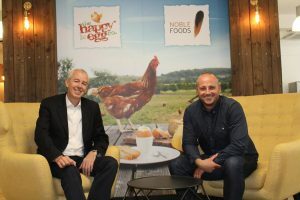 Noble Foods launched The Happy Egg Company brand in 2009 and is now the market leader with sales of around £65million.